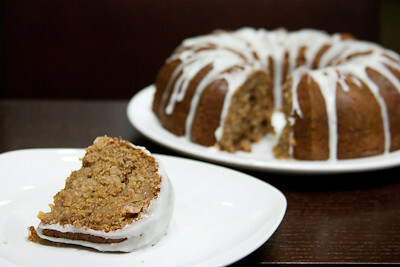 This week's Tuesdays with Dorie (TWD) recipe was chosen by Lynne of Honey Muffin: Double Apple Bundt Cake. I already said last week that I love baked apples.... so I was pleased to see yet another apple recipe picked for this week! With the weather finally cooling down here (into the 80's - ha!) and all these apple recipes, it is finally beginning to feel like fall! This is another quick and easy recipe, with the exception of the time it takes to grate the apples. Truthfully, that still only took me about 15 minutes, so it really wasn't bad at all (and I did not have a grater so I sliced them into slivers). I made a few slight changes to the recipe. I doubled the cinnamon because 1/2 teaspoon seemed like so little. I omitted the nuts, but did add the raisins. I think dried cranberries would be wonderful in this cake, too. Instead of 1-1/2 cups of white sugar, I used 1 cup white sugar and 1/2 cup brown sugar. I'd like to use all brown sugar next time to see how it tastes, and top the cake with a caramel sauce instead, because I love this apple cake with caramel sauce and Dorie's recipe seems much "healthier" (relatively speaking). Wow was this cake good! So moist and full of apple flavor. I think the apple butter gave it that extra little something that just made it special and set it apart from other apple cakes. The lemon icing on top is a nice, tart contrast to the sweetness of the cake. I just finished baking this cake this evening and I'm not sure if it will even last 24 hours! Thanks Lynne, for hosting this week. I will definitely be making this one again and again! If you would like the recipe, you can find it here. Make sure you check out the TWD Blogroll, to see how everyone else enjoyed this fall treat! As a reminder, if you'd like to meet Dorie during her current book tour, see if she will be visiting your city here. If you'd like to join us at her cooking class here in Dallas on October 24th, sign up here. - I used 1 teaspoon of cinnamon instead of 1/2. - I used 1 cup of white sugar and 1/2 cup of brown sugar. - I used Gala apples which were perfect in this recipe. - I baked my cake for a total of 60 minutes, 5 minutes longer than indicated. - Wrapped well, this cake will keep for 4 days at room temperature or 2 months in the freezer. You made the same changes as me! This cake was amazing- so moist and apple-y. Yours is beautiful! Your cakes are always so pretty! I want to make it too, and I would totally use all brown sugar, it must be amazing! Your cake looks great. And lemon icing is such a unique way to top it off! Your cake looks perfect...and love your blog! Happy you could bake with me this week! Yum! Your cake looks perfect and I love the contrasting look with your white icing! This IS a keeper. That glaze dripping down the sides is seriouisly making me drool right now. Caramel and apples is definitely the way to go! Your cake looks lovely, Jaime! I like your idea of using part brown sugar; I'll try that next time. And I'm so excited--I'm going to Dorie's class at Central Market here in Austin on the 20th! I can't wait. Wow your icing looks perfect--great photos! 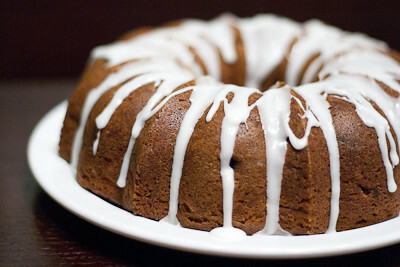 apple butter is a great thing to sneak into cakes of any flavor, but it's particularly appropriate here--well done!